Clara, patron saint of television and eye disease, stood three feet tall in the church at the end of the road. The road was known generally as la calle, for it was the only one in the village, narrow, sprouting caminos and footpaths as it went. Scattered along it were one church, one store and a one-room schoolhouse, recently closed. The road ended in a small square, where the town hall stood, and a cantina with the town’s only television. It sat on a foldaway table, and when the men weren’t hunched around it watching the football, it spun lazy afternoon offerings of love and betrayal, murder and long-lost sons. Clara, beauty of Assisi, nobleman’s daughter, ran away one night to a friar at the roadside, was brought to Saint Francis and shorn. Her hair fell like cornsilk to the ground and she traded her dress for a rough brown habit. She walked barefoot and lived in silence and begged for her daily bread. But she didn’t mind. She’d fallen in love with something larger than her world. Clara was ill one day, Papi said, and couldn’t go to mass. She lay faded in her bed, and what flickered on her wall but a vision of the daily service, from processional to homily to eucharist? And so they made her patron of eye disease, because what could have visited her but a dance of glaucomic flashes? And then television came along and needed a patron, and the pope said Clara. And how about the time, Papi once said, when she faced down an invading army, alone at the convent window with nothing but the sacrament in hand? Now, Clara spent her days tucked into a dim chapel. Day in, day out, alone in the shadows, and if anyone did visit, it was only because they wanted something. But that night was La Noche del Maiz. The village priest brought her down from her perch and wiped tenderly her web of whisper-fine cracks. He wrapped her in finery, silk robes and nylon flowers, and loaded her on her platform. Four strong men raised her high and she wobbled down the road but didn’t fall—not once had she fallen—and so it began: a trumpet’s cry, a line of altar boys, the swing of a cloud-belching censer. Fine for a saint, thought Solimar, to wait all year for a single tromp through the village. Fine for a saint to spend all of eternity with her mouth shut, her feet still. Solimar Castro Valdez was no saint. She was breaking out. She’d come out that evening to meet a man, not a friar. His name was Manuel. He owned a car and a passport—the right kind—and he’d be taking her away from this place. And he was there. Right there in Santa Clara Popocalco. For months, the idea of leaving had lain dormant. But it was stirring now, snuffling to life. Every cell in her body strained against its casing. It was time to leave. It was time. Manuel would meet her at the entrance to the town hall. Slowly, slowly, the procession moved on. She walked hand-in-hand-in hand with her mother and father. She squeezed their papery old fingers and pulled harder with each step. When they turned a corner, she spotted the clock tower by the church. Seven minutes late already. She flung off her parents’ hands. “See you there!” she cried, and ran. At the town hall doors: no Manuel. No one who looked like he owned an American passport. A man like that would have to be handsome—not that handsome mattered, not when all she wanted was the land beyond the border, except that she was eighteen and helpless against the nether-murmur of romance. At the town hall doors, breathless still, she waited. Papi found her and brought her a plate of tamales, which she was too jumbled inside to eat. Mama would be milling through the village plaza and finding old friends from nearby towns, stretching spools of gossip that had begun a month, a year, a decade before. As the sky dimmed, drums and horns throbbed through the square. Drink had been drunk and around her the village swarmed with new faces: where had they come from? A pair of teenagers leaned and kissed against a tree, a flutter of children linked arms in a circle, running themselves off their feet, a perilous carousel of arms and legs and fevered teeth. Still, no Manuel. She felt she should smoke a cigarette, though she’d never tried one before. She believed a cigarette would make her feel like less of a waiting fool. Never had she seen so many people here, in her little village. Most days, it seemed the world had forgotten Santa Clara Popocalco. It was the sort of place that existed only because no larger town had cared to claim it. It lay dry and hollow, anchored to this earth by the Sierra Norte to the east, Oaxaca city to the west. Every morning a cold front rolled in from a distant shore. It collided with the hillside and smothered the valley in fog that smelled faintly, sweetly of corn. Every afternoon, the sun burned through the fog, and houses regained their low and addled forms. Popocalco offered no work, only the growing and eating of a few stalks of corn. When the money left, the people followed, except for the very poor and very old, who still grew crops to feed themselves and sell in local markets, who gurgled through the village square every morning and in the evenings, visiting the church, nodding to the faces, always the same faces, and napping and cooking and eating and washing, sweeping their front steps each day, not exactly waiting to die, Soli believed, but not quite living, either. For too long, she’d pushed away the thought of leaving. Papi! She was his only one. And Mama. Mama would crawl into bed and never crawl out. But decay had spread like the valley fog, until it found its way to Soli. She’d breathed so much of it in that she couldn’t breathe it out again. She was filling up with silence and heavy bones. She was eighteen. And then, the letter from Silvia. Inside, somewhere between her chest and chin, a seed split open to the sun and she began to wonder: Could she? And how? And eventually: When? And why not? And how soon? Her life lay elsewhere. If she stayed in Popocalco, she’d be staying for them, the gentle old souls, her mother and father and the sullen corn, watching all those lives wind down to their modest end. The fireworks family entered the square, pushing the castillo de luces, a tower of scaffolding rigged with rockets and sparklers. In the big picture, Popocalco was nowhere. In the big picture, it was a thin and spiny stretch of the past. She waited for an hour at the church door, until all her readiness had been sighed away. Papi wandered off. She stood deflated and alone, certain she’d missed Manuel by seven minutes. A brass band began to play, the somber nasal tune Soli had heard every year, for as long as she could remember, at la Noche del Maiz. She closed her eyes. Applause. She didn’t need to open them to know that a teenage boy was climbing the castillo, lifting a fiery pole to the highest joints of the tower. In a moment, the first sparks would pinwheel through the night. And they would begin, one small explosion followed by the next, a rapturous storm. Punctuality. Seven minutes. Time was religion in America, Papi had warned her. If she’d missed her chance by seven minutes, it was her own wretched fault. But then, a layer beneath the noise, a rustle. “Solimar.” She opened her eyes. At first, all she saw were the bushy jut of his chin and the gleam of hair slicked back. He could have been the Devil in the firelight, for all she could see. He stepped forward. Papi, all at once, beside her. He shook Papi’s hand. Now this, now here, was a man with a passport. Manuel would visit the next day to go over their plan. He’d get Soli to California, he said, no matter what it took. She was leaving! The promise of it stoked a flame that blazed through her. Already, Popocalco, this house of smoke, was shrinking away. Already, this existence nothing but a distant prick of light. Electrified by the promise of forward motion, Soli stretched up to kiss the sky, growing and growing, until she too was a flaming tower, a castle of light, sparking from the eyes, spitting streaks of joy. 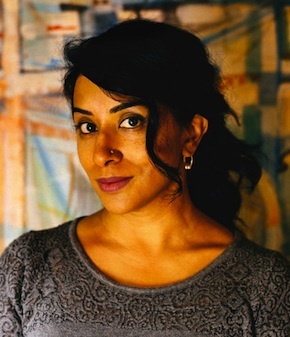 Shanthi Sekaran teaches creative writing at California College of the Arts, and is a member of the Portuguese Artists Colony and the San Francisco Writers’ Grotto. Her work has appeared in the New York Times, Best New American Voices and Canteen, and online at Zyzzyva and Mutha Magazine. A California native, she lives in Berkeley with her husband and two children. Her first novel, The Prayer Room, was published by MacAdam Cage. 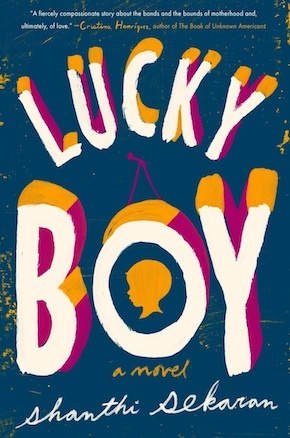 Lucky Boy is out now from Putnam. Read more.